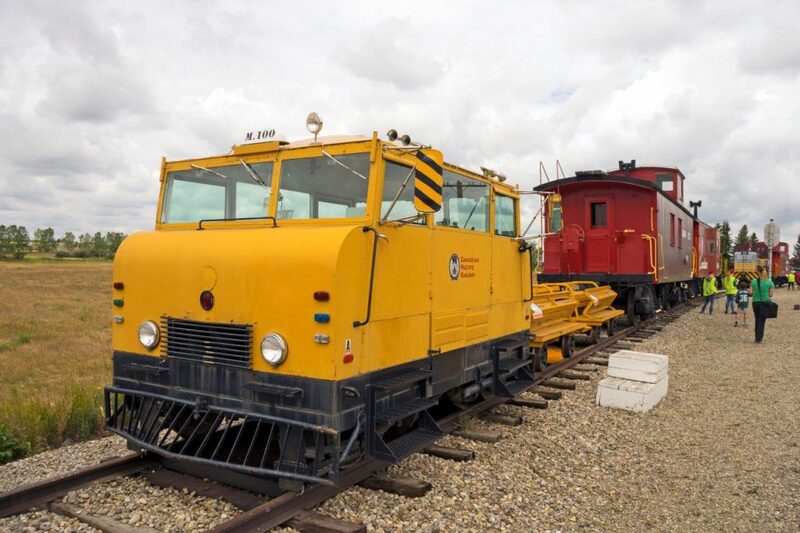 Last August 5th, a Saturday, my wife, daughter and I had the opportunity to check out a ‘behind-the-scenes’ tour of the Champion Railway Park, located just 5 km NE of Okotoks, or 7 km straight north of Aldersyde off Highway 2 on the way to Calgary. We (along with countless others) have passed it numerous times and often thought driving by “what is this place?” and “Boy I’d love to get inside to check it out!” Since its inception in the late 1970s / early 1980s it was owned by realtor Gerald L. Knowlton and his family and was just recently jointly donated to both the MD of Foothills and the Town of Okotoks. But first some background about this neat place! 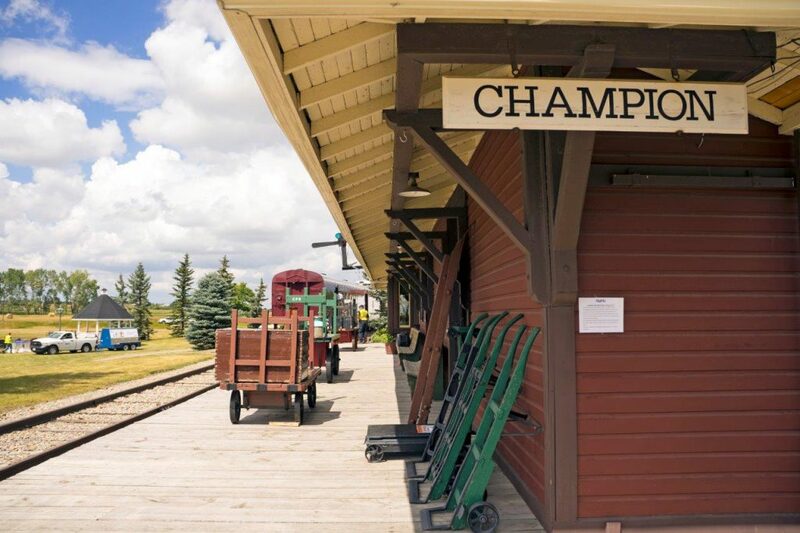 The Champion Railway Park was the private collection of Canadian Pacific Railway equipment, artifacts, and structures, wide ranging from a lowly bunkhouse to the Champion, AB train station! 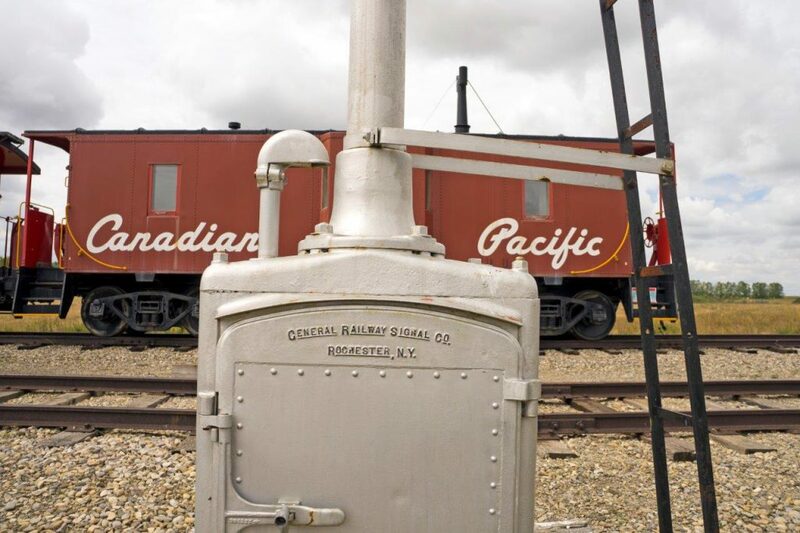 The whole idea of the Park began in 1979 when Gerald wanted to build something as homage to the Canadian Pacific Railway (partly due to some of the rural train stations being demolished) and also as a family tribute to his parents, Frederick (Ted) and Faye Knowlton. 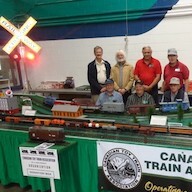 Ted was the station agent at Standard, Alberta for some forty years! 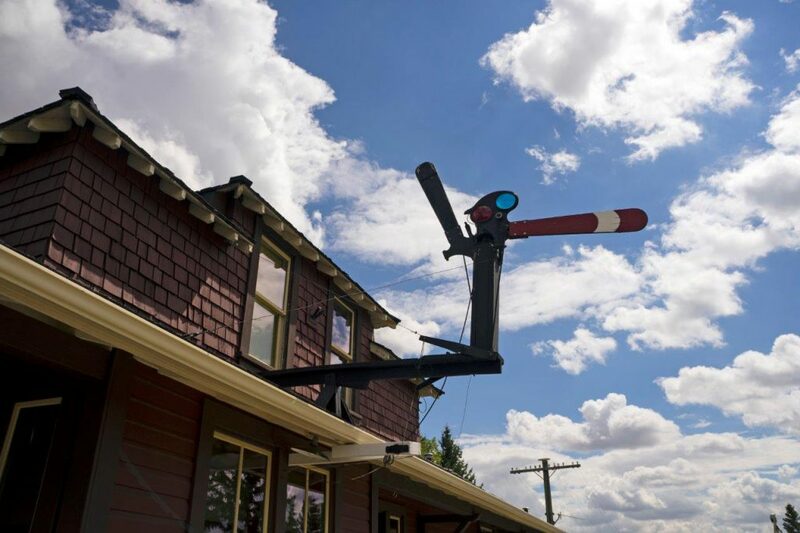 Considering the Standard train station was lost to the wrecking ball, Gerald and some friends went around to five other remaining train stations left standing in southern Alberta to find a replacement for his idea. Out of all left standing, the Champion station was in reasonable good shape and closest to what Ted worked out of as a station agent (and what Gerald grew up in as a child). He was able to work out a deal with CPR to purchase the former station. While this was occurring, his family scouted around for land to relocate the station to, and the current 54-acre site of the Champion Railway Park was obtained in late 1979. Gerald’s daughter Marie-Catherine recommended that site be chosen out of all the ones the family looked at. The Champion station was then relocated to the recently purchased property a year later, and left on blocks until a proper foundation could be built. Then the station was moved onto its new foundation and a lengthy restoration job began. Gerald’s vision was to recreate the environment that his dad was familiar with at Standard; that would mean additional buildings would be needed for the site! 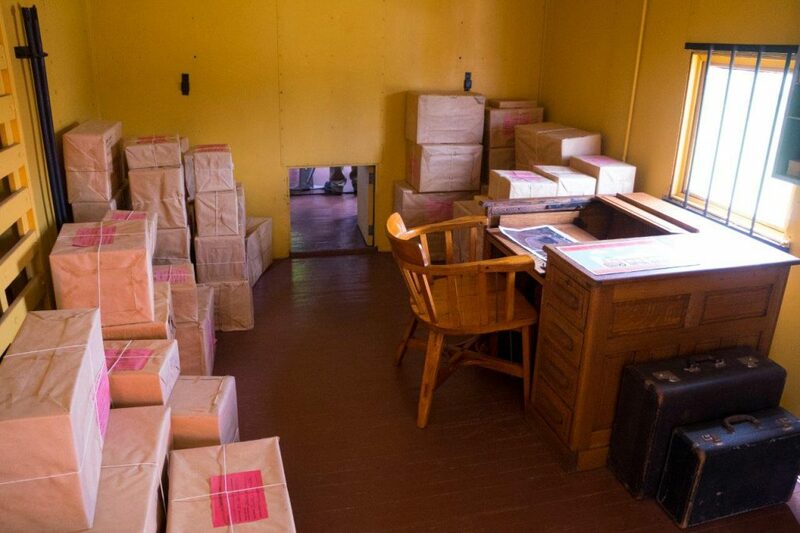 Collecting railway buildings (or railway cars for that matter) wasn’t easy, but Gerald took advantage of every opportunity the CPR presented to collect the necessary items for the Railway Park. Using contacts within the industry, additional items (and some volunteer labour) was obtained to help move the project along. By the mid-1990s the site was mostly developed and an interesting collection of railway equipment was obtained. A section of track (approx. 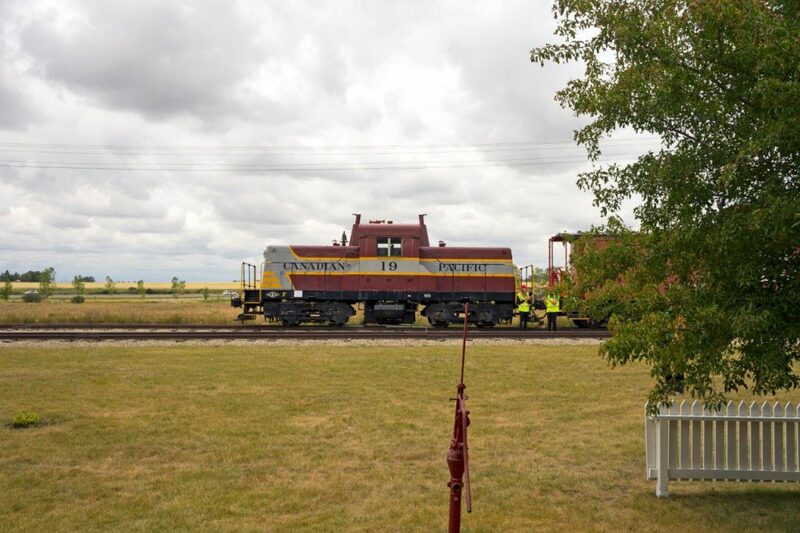 ½ mile long) was built out front of the station, allowing either the Inspection Car or the 1960s era diesel locomotive to move along the track giving family and close friends rides on the rails. An interesting side note that former CP president N.R. ‘Buck’ Crump actually hammered the last spike in the track construction at Champion Park in June 1983. By the late 2000s Gerald and his family wanted to slow down and relax a bit and the discussion of the future of the Park came into question. They felt the Park needed a stable future to continue and that the public should have access to it. 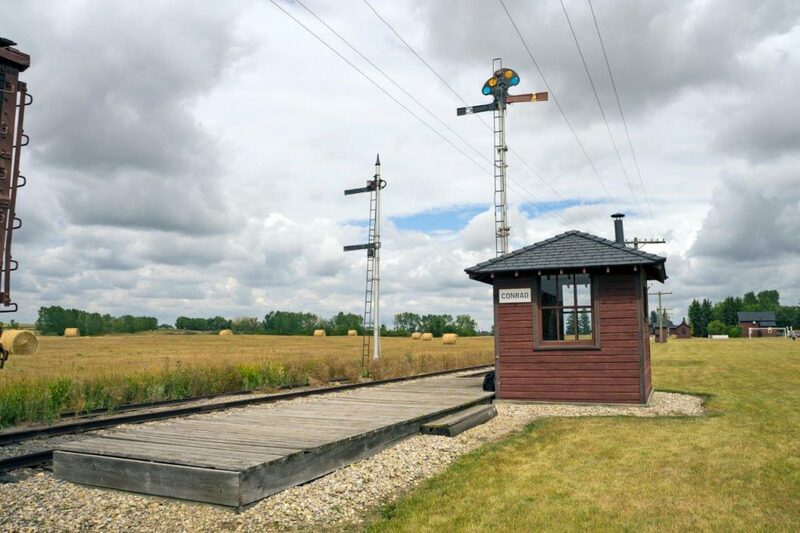 Discussions with the local municipal district and the neighbouring town of Okotoks took place, and by the late summer of 2016 a deal was in place, and a handing-over ceremony took place at Champion Railway Park on September 16th, 2016. The deal called for a joint 50% ownership between the MD of Foothills and the Town of Okotoks, with the deal coming into effect on January 1st, 2017. A non-profit society “The Friends of Champion Park” (comprising of former volunteers of the Park, representatives from both municipalities, and interested members of the public) will be formed to take on the maintenance and operation of the Railway Park on behalf of both the MD & the Town. Additionally, the Society will be tasked on the creation of a five-year plan for the transformation of the private park to a public event space. Mind you, transferring land from a private family ownership to a public entity is a lengthy process in its own self with its own set of hurdles to overcome. 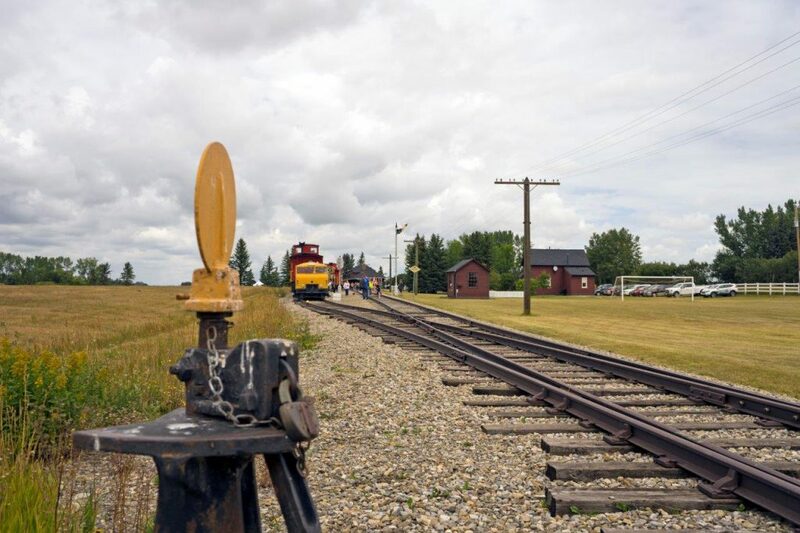 Operating the Inspection Car and locomotive in a public park requires additional certification and regulations to be met at Alberta Transportation. I was told at the event that the Town of Okotoks is working with Alberta Transportation on setting up the required paperwork to allow the rail items to be operated by trained volunteers. Both municipalities spent the majority of 2017 evaluating the park to ensure certain standards (i.e. health/safety regulations) are upgraded to allow the public to use the Railway Park. 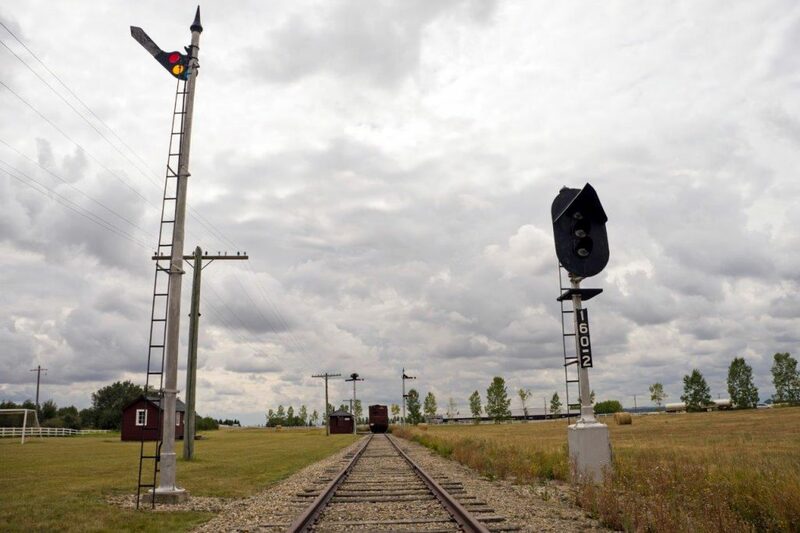 It was also decided that an open house to the public be arranged over the long weekend in August as a ‘sneak peek’ to what the Railway Park can offer. It is hoped that more public events, tours, and educational opportunities will be added over the next five years. But now back to the open house event! Surprisingly, I found about the open house on Facebook on the day before the event was to take place. Reading the event description, it talked about RSVPing for a seat on a bus that would take us from the Okotoks Recreation Centre over to the Champion Railway Park (as there isn’t enough parking on the site). It also mentioned the bus seats were already 75% claimed, so I quickly found the phone number of the Town of Okotoks and after talking to a representative, she could walk me through the online booking process and I was able to secure 3 tickets (all free of course) for a 11:45 am trip. Awesome! Saturday morning, we left Lethbridge early enough to make the just under 2-hour drive to Okotoks (with the long weekend traffic to deal with). At the Recreation Centre we loaded onto school buses and took a 15 minute drive over the Railway Park where we were dropped off and then left to tour! The majority of the crowds on the site seemed to be around the Champion train station, so we decided to go to the south end of the Railway Park first and then go northwards. The first stop going south along the train track was a unique design, a steel-bodied caboose with bay windows on either side with no cupola! 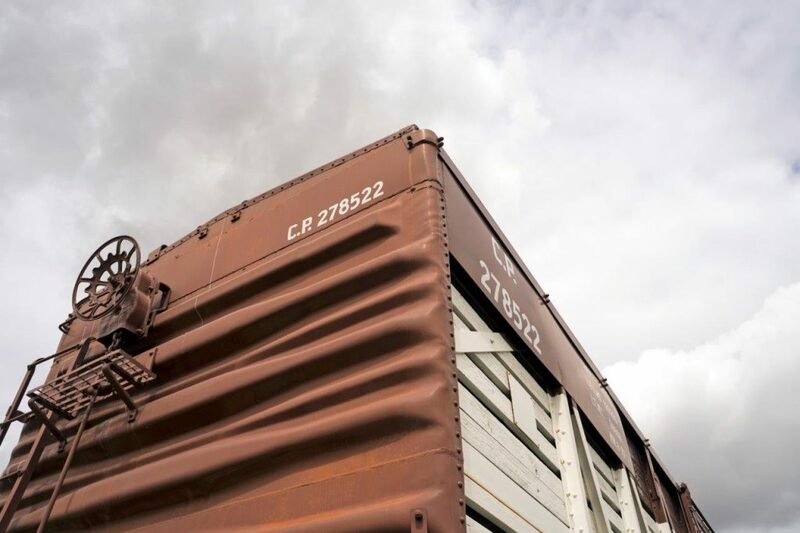 This caboose, (#437266) was used on switching and transfer runs and not used on mainline service. 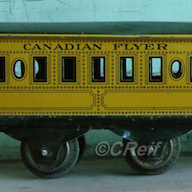 It first entered service in 1948 and was retired by CPR in the late 1980s. Beside it was a classic wooden caboose (#437178) from 1945. And at the front of the ‘train’ was a standout in the collection (in my opinion), a small diesel switcher built by the Canadian Locomotive Company, DTC-2 (44H44A1). CPR #19 was built in April 1960, one of five in that order. 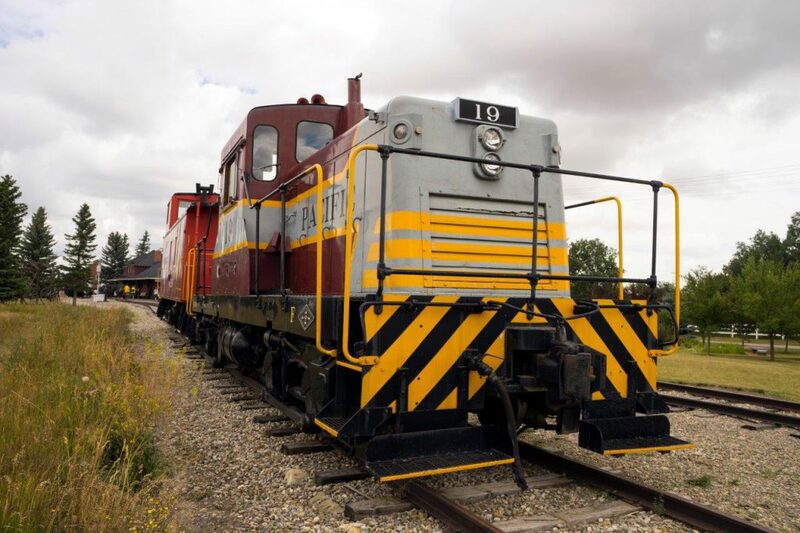 This type of locomotive is unique as unlike regular diesel locomotives that have a single engine driving a generator or alternator which then powers motors connected to the wheels, this one uses a hydraulic torque converter drive, almost like a car’s automatic transmission. As well, it uses two small diesel engines; each driving one set of trucks. The power is sent to one axle and then sent to the other via a side-rod arrangement (very steam locomotive like)! 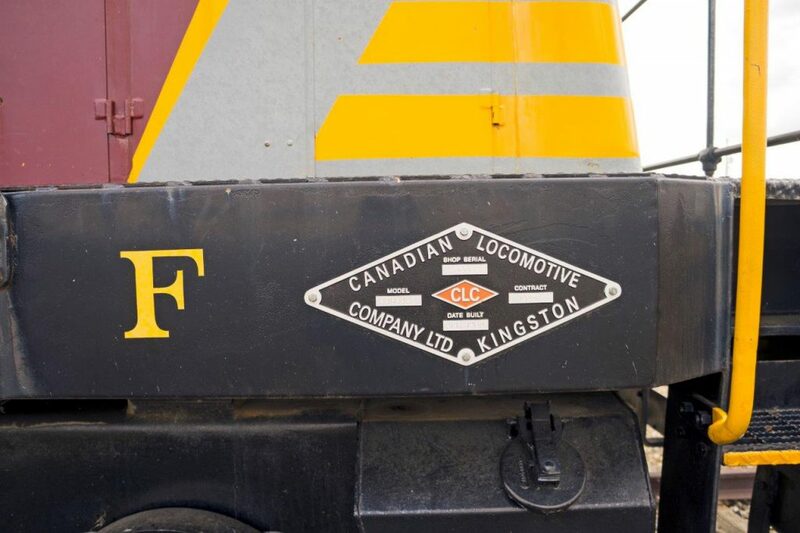 In total, CPR owned 14 of these locomotives between 1957 to 1960 – this locomotive was from the last order CPR ever placed with CLC. 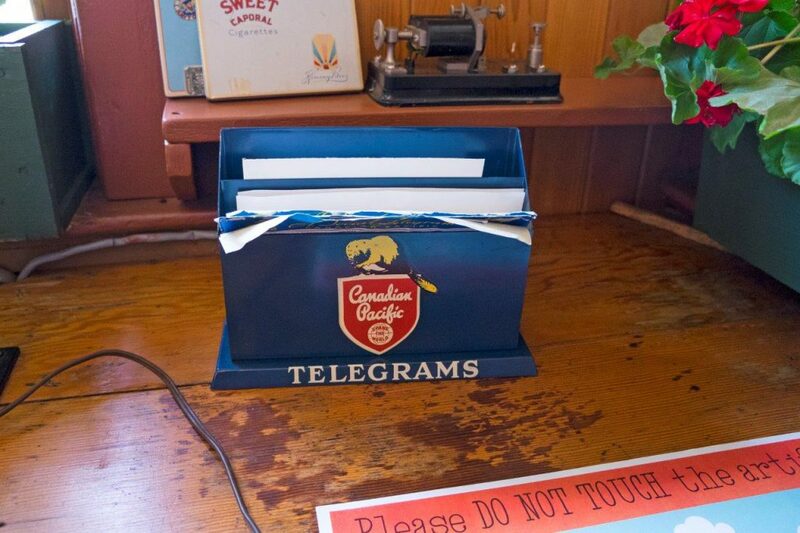 Number 19 was used at the CPR Angus shops in Montreal before getting sold off in the fall of 1972. It traveled west working at various industrial firms until arriving at Champion Park in 1987. Presently, only two other DTC-2s exist in Canada, including one located in the Thunder Bay, Ontario area and the other at the South Simcoe Railway Museum at Tottenham, Ontario. From reports it sounds like the South Simcoe example, #22, isn’t operating – I am not sure on the other example if its operating or not. 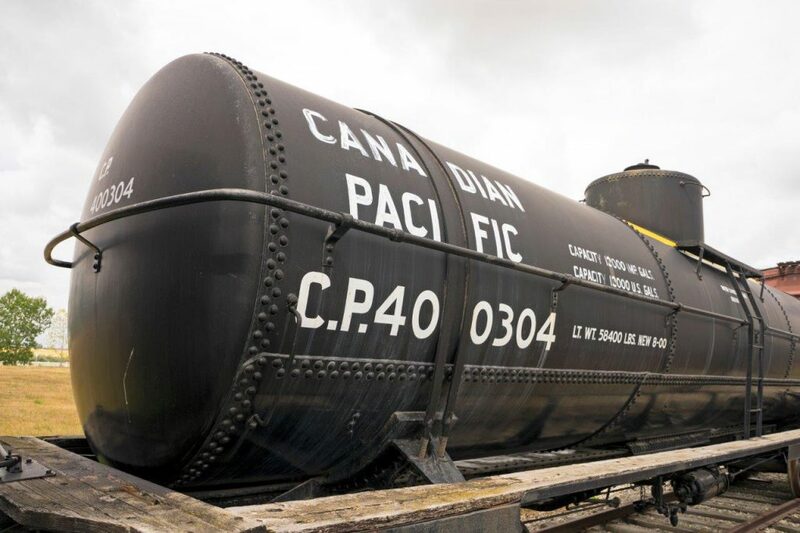 Two DTC-2s were located at Fort Steel Heritage Park outside of Cranbrook, BC but were recently scrapped in 2010. I found a photo of a similar unit (CPR #10) in my railway slide collection, used at the nearby Coleman Collieries coal mine in the Crowsnest Pass at Coleman, AB. In front of #19 was a 1955 United Kingdom built Wickham Inspection car (M-100) with two man carriers. The man carriers included seats to take employees to the worksite, now it would take visitors on tours! After looking the railway equipment over we walked over to the section house, and looked things over. The section house was a replica of what was at Standard, Alberta. Afterwards we walked over to the Engineer Inspector Communications building (I liked the pebble glass on the door! ), then a bit farther we walked over to the railway bunkhouse. 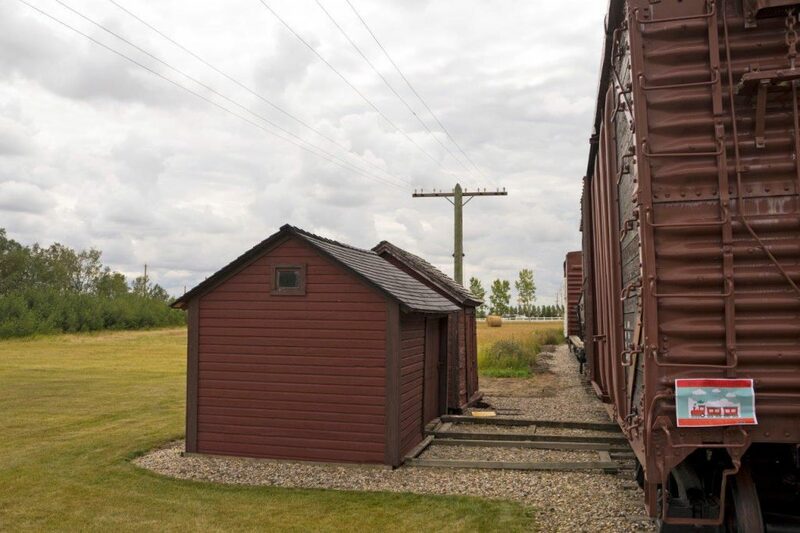 The bunkhouse had a familiar look (as we have two at the Galt Historic Railway Park that were originally from Coutts) though the Champion examples are finished and filled to the brim with railway artifacts. 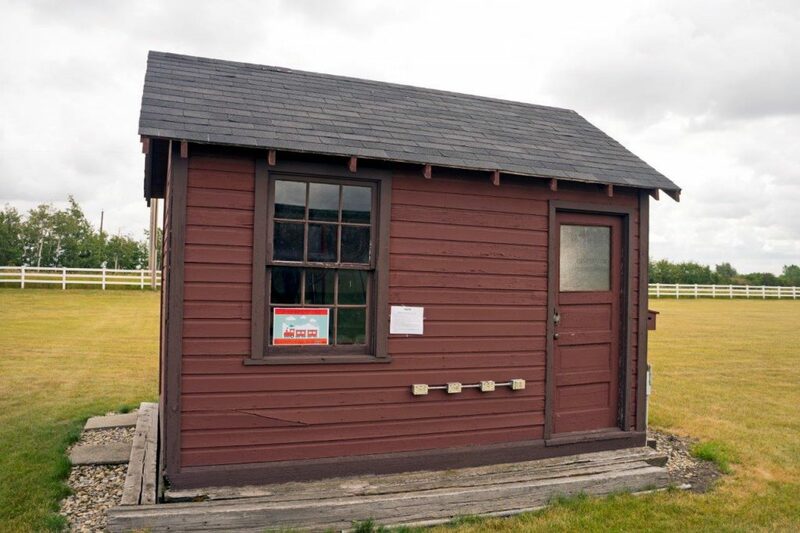 A building like this would have been located at strategic points along a railway line and would have been used by railway employees for sleeping / living accommodations while working. 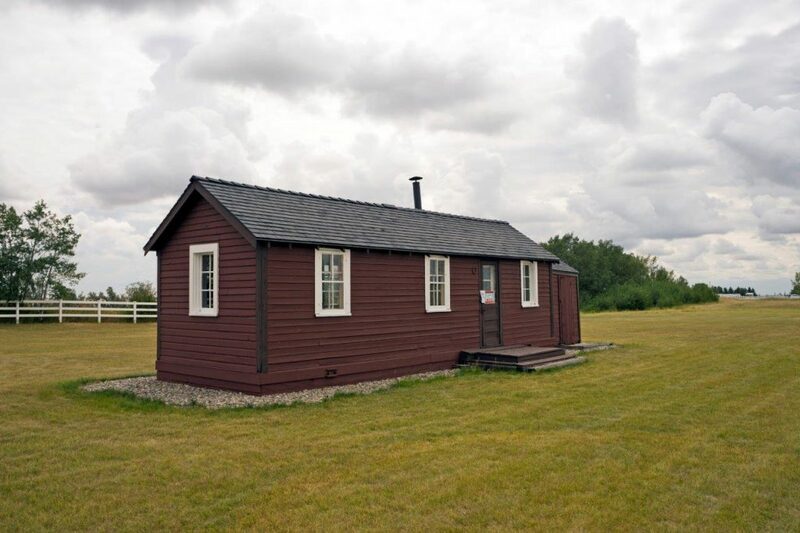 Both the Communications building and bunkhouse actually originated from Milo, Alberta! Not far away were the typical prairie outhouse and a bit farther away a smaller, squarish building situated against the track with ‘Conrad’ mounted on the side of it. I had heard that the Railway Park had obtained the original Conrad flag stop station and here it was! Peering inside the window it was pretty basic; a stove and some benches to sit on that’s it! On a side note beside the Conrad station was a semaphore mounted on a tall pole. I don’t think it would have been the same setup at Conrad, but without seeing a historic photo of it in operation, it is hard to say. It is interesting to see never the less! A bit father south of the Conrad station was a speeder shed and a general storage shed. 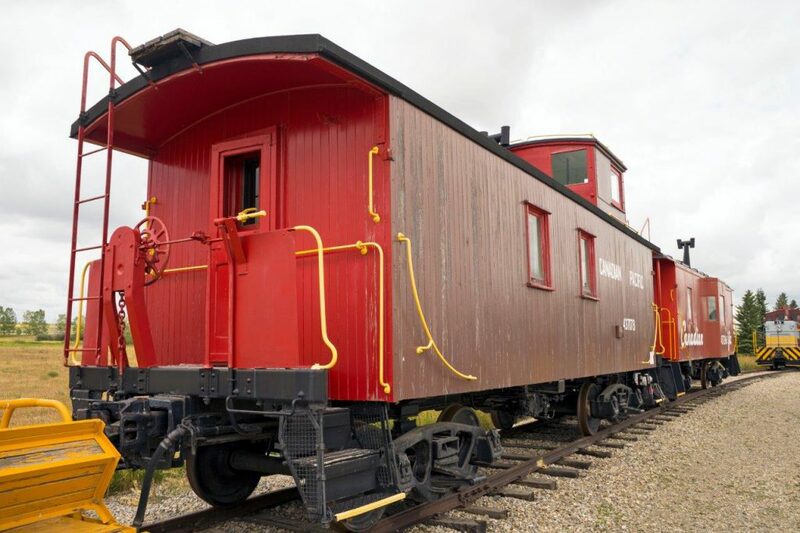 On the grounds there is a variety of freight rolling stock, including a wooden boxcar, a tank car, and a wooden stock car! 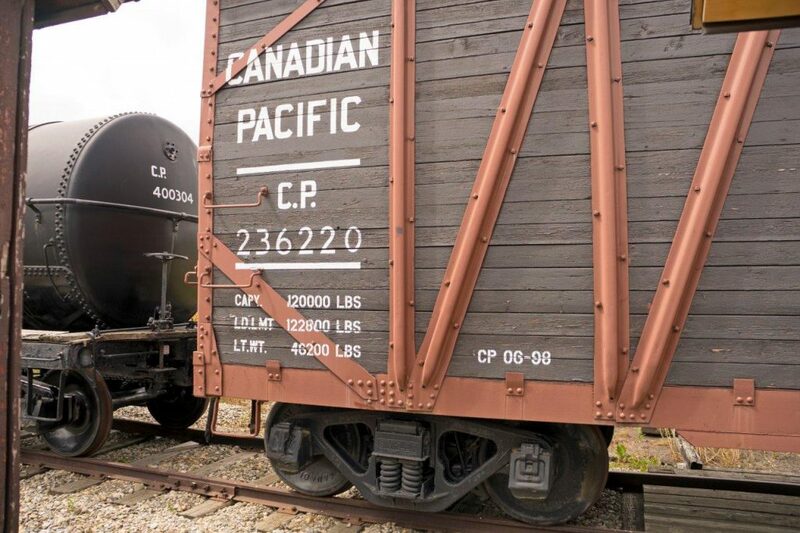 The wooden metal-braced boxcar (#236220) dated back to 1920, along with the tank car (#400304) which was from 1923. The double deck wooden stock car (#278522) was a newer design from the 1950s. We then walked the track back towards the train station, pausing at the grade crossing to see the vintage warning ‘wig-wag’. 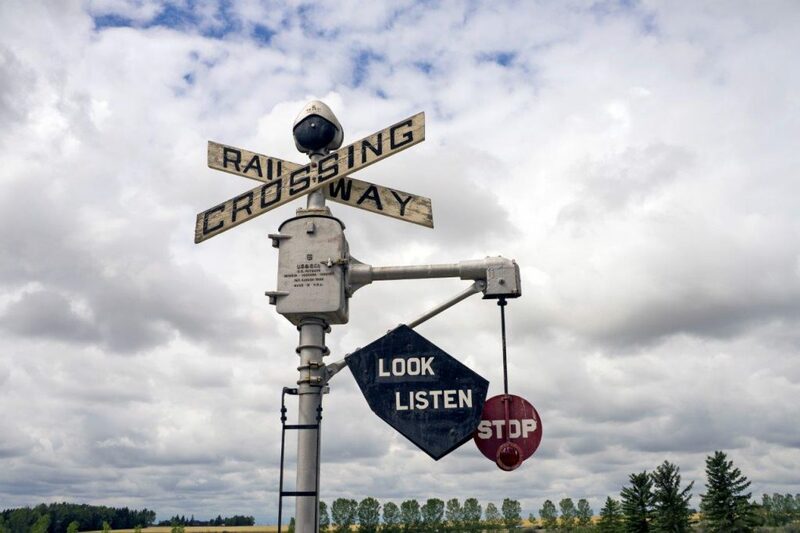 The wig-wag was a early type of warning device at the turn of the twentieth-century; as a train approached the arm (with attached warning light) would swing back and forth and the bell above the arm would sound off, warning drivers that a train was approaching! Following the paved pathway down towards the lake we had our picnic lunch! It was very relaxing sitting by the lake eating lunch and watching the ducks float on the water. 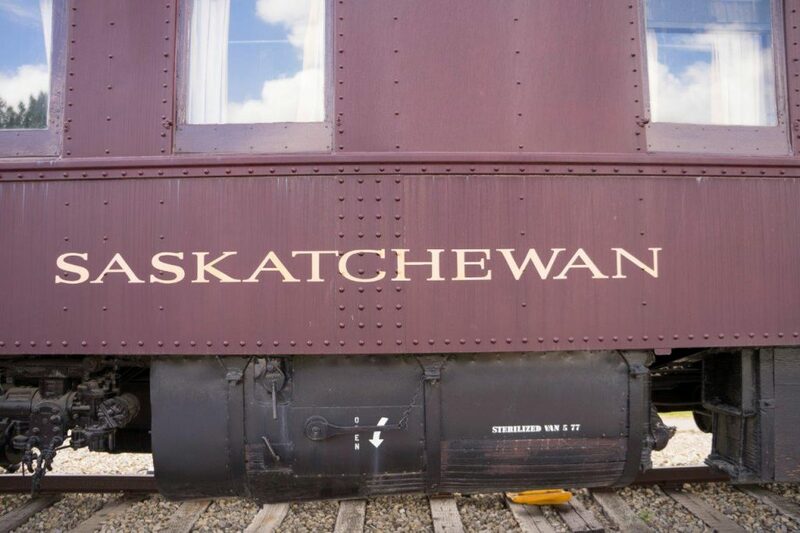 Afterwards, we walked up the hill towards the restored mail-express car and the ‘Saskatchewan’ business car. 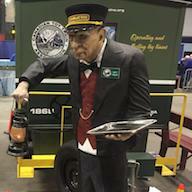 We were given a tour of the mail-express car by one of the Park volunteers. The mail-express car #3622 was built by Canadian Car & Foundry in January 1947 and entered service with CPR not long afterwards. 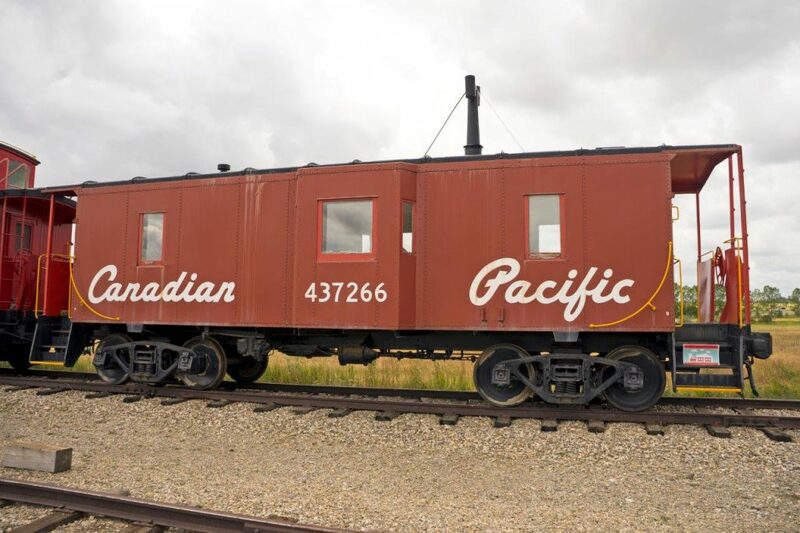 CPR sold the car off in the mid 1980’s and it traveled north to the Alberta Railway Museum for a spell. 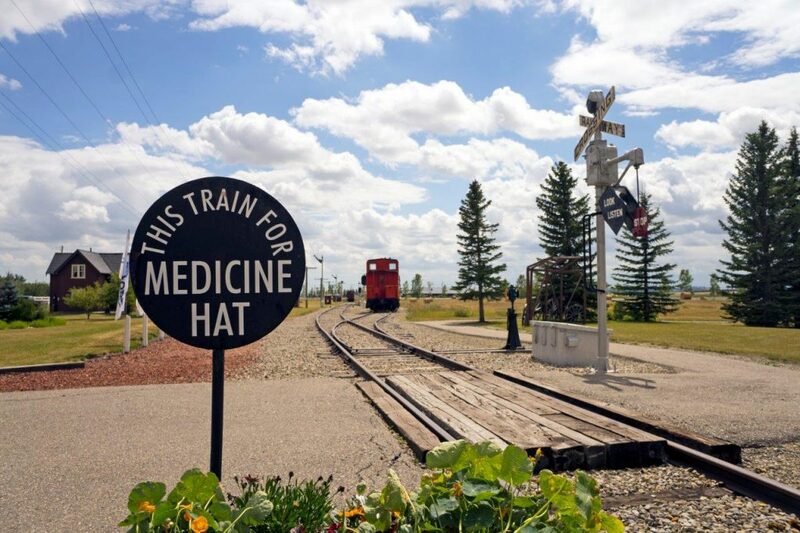 It then went to the Museum of the Highwood by High River in 2002 as part of their railway display for a time, before Champion Park purchased it in June 2013. Some renovation work was done on the car after it arrived at the Park, but it was in relatively good shape. 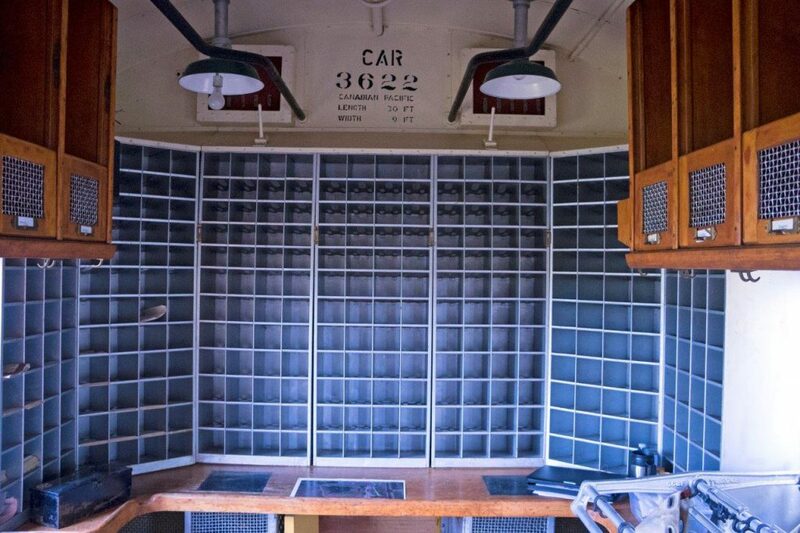 When you step inside the car, you definitely feel you are in a Railway Post Office car! 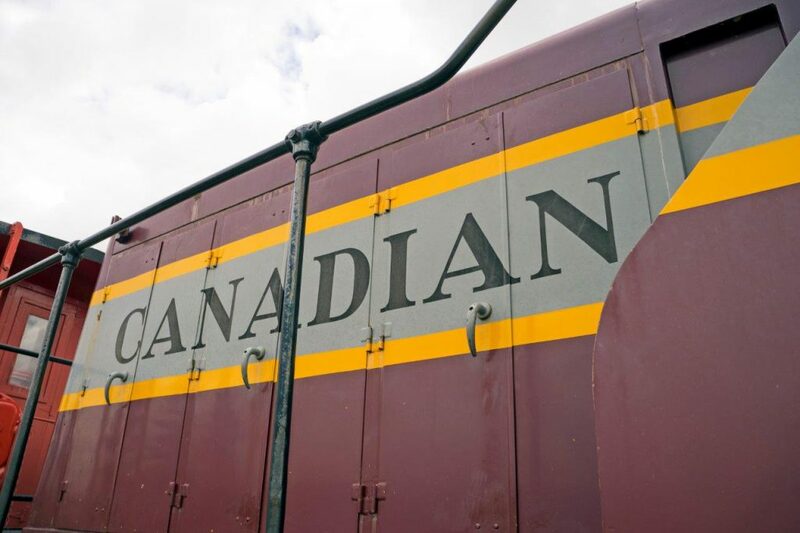 The ‘Saskatchewan’ was built in December 1929 at the CPR Angus shops in Montreal, Quebec and used to move CPR management around the country. 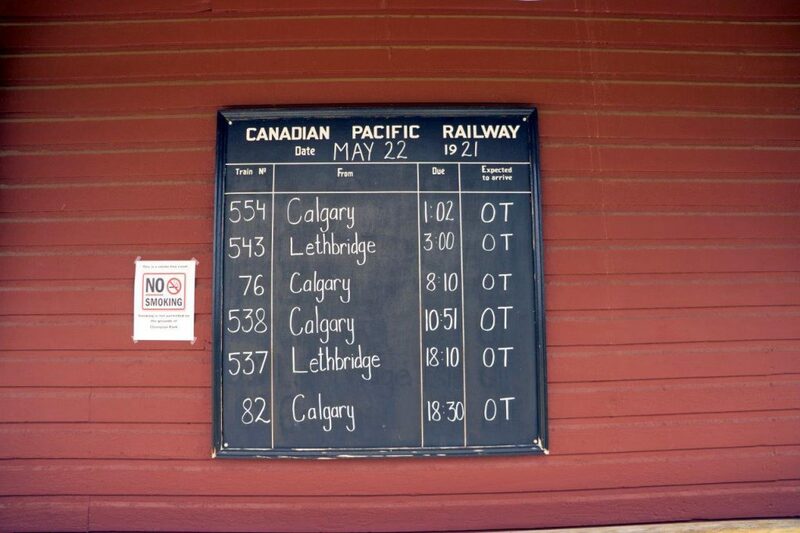 After the tour, we walked back outside and down the track a bit to the “Saskatchewan” business car. It is well appointed and filled to the brim with high quality wood and carpet / velvet materials. Inside included a living area, bathroom, five bedrooms (with separate bathrooms), a dining area, and a compact kitchen space. I could imagine myself living in a railcar like this! On the end of the car was a spacious covered outside deck where people could sit and watch the passing scenery! The Champion Railway Park acquired the Saskatchewan in 1983. 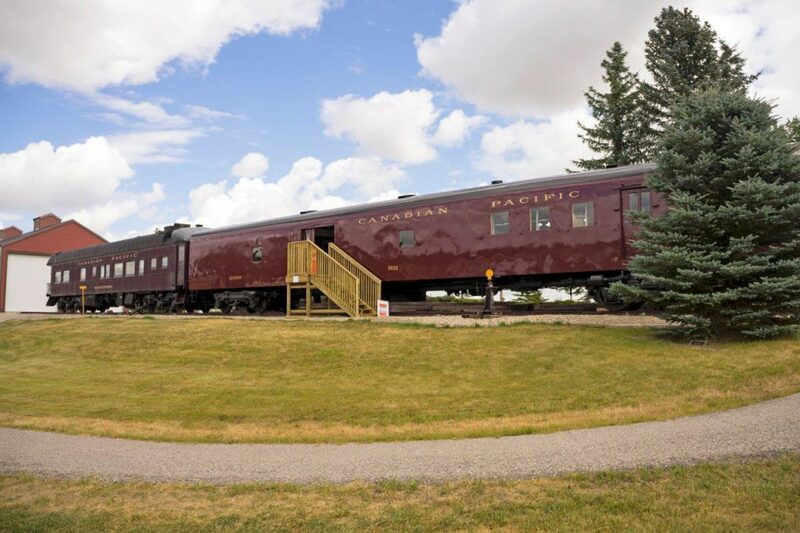 In fact, former CP president Crump was actually instrumental in having the Saskatchewan car relocated to the Champion Railway Park! We walked through the vestibule into the rear of the mail-express car, where another Park volunteer greeted us and gave us a brief explanation of the car (basically a downsized baggage car). I was surprised how detailed the interior was, for just being a basic baggage car. All the period correct items were mounted inside in the right locations…no detail was overlooked, and that little bit of attention I appreciated. The restored Champion train station. Based off the CPR Station #5 plan, the Champion station was built at a hefty sum of $4,500 dollars in 1911. We then headed towards the final spot on the tour, the restored Champion train station. Based off the CPR Station #5 plan, the Champion station was built at a hefty sum of $4,500 dollars in 1911. Walking in the first door was a compact waiting room complete with vintage CPR posters on the wall and the ticket seller’s window. 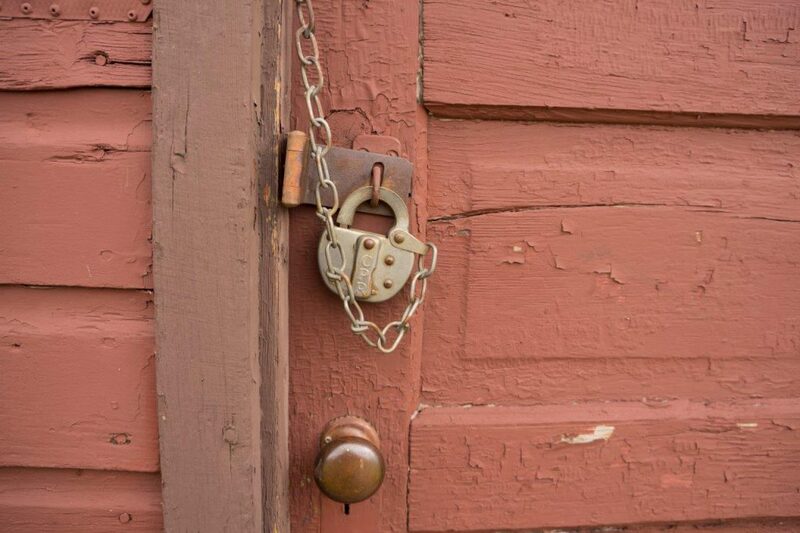 Peering inside, we could see the stationmaster’s area with the telegraph keys. Through the open door on the opposite wall we could see down the hallway into the freight shed. 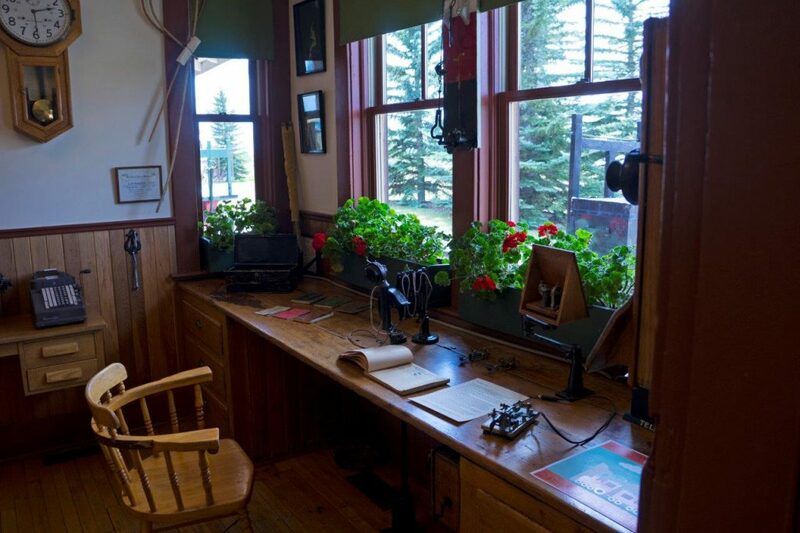 We then walked outside on the platform, past the bay window, and stopped by another door (that led upstairs to the stationmaster’s living quarters – now occupied by people that look after the Railway Park in the off season). A bit father down the platform was the large open sliding door of the freight shed, where a Park volunteer was giving demonstrations on how to ‘hoop’ train orders to locomotive crews. At this time, we then realized we were one of the last public visitors still at the Park, and that the Town employees / Park volunteers were cleaning up and taking stuff down for the day! We then decided we better head to the bus loading area to head back to our car at the Okotoks Recreation Centre. I wished we could have stayed a lot longer, but it was a hoot never the less. My friend B.J. Errson, who is one of the many Park volunteers, signed me up for future work parties, so I look forward to returning and hopefully riding in the CLC locomotive! Thanks to both the MD of Foothills No. 31 and the Town of Okotoks on stepping up to help take over the reins from the Knowlton family – it is greatly appreciated! Jason Paul Sailer was born in Medicine Hat, Alberta and grew up on a farm south of town. Memories of taking grain to the wooden grain elevator with his dad and watching the trains moving the cars left a lasting impression on him. After college, he moved to Lethbridge, Alberta to be employed as a senior architectural technologist. He is currently married and has a young daughter . 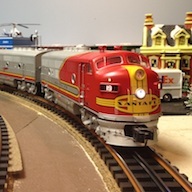 In Jason’s spare time he is an avid photographer, researcher/blogger, and rookie HO-scale modeler. Jason also serves as a secretary with an local railway museum (the Galt Historic Railway Park) and as president of the Ogilvie Wooden Grain Elevator Society, preserving an 1925 Ogilvie Flour grain elevator.